The CT-ATSCQAM8-IP is a digital tuner capable of receiving eight digital off air (ATSC/8VSB) and/or clear QAM signals and processing the signals to provide an IP output. The IP output is compatible with the COM2000 system as well as many other systems that can process an IP signal for either viewing or re-processing. 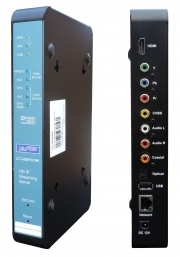 The CT-HDIPCOM HD IP Streamer allows the user to stream any one audio/video source over a IP Network to multiple Smart HDTV\'s or connected computers within the IP Network and is compatible with Technicolor COM2000 systems. The IP Streamer accepts a HDMI, Component, or Composite video input and the unit is designed to deliver a rich HD/SD Streaming experience for its users deploying MPEG-2 or MPEG-4 standards. The CT-HDIPCOM Streaming server enables high-definition streaming with resolutions up to 1080p, providing a high quality viewing experience for your customer. The unit is MPEG-2 or MPEG-4 switchable and supports UDP/RTP Streaming. The compact design saves space and is easily controlled via a web UI for rapid deployment.